I have never met any person living in France who worries about baking baguettes at home. Why would anyone do so, when they can walk a few steps from the front door and find the very best examples, fresh from the oven? But when you live in the US the situation is totally different. The stuff you see sold as “baguettes” could bring Paris back to 1789. Some, if held up, will fold. Wrap your mind around that. 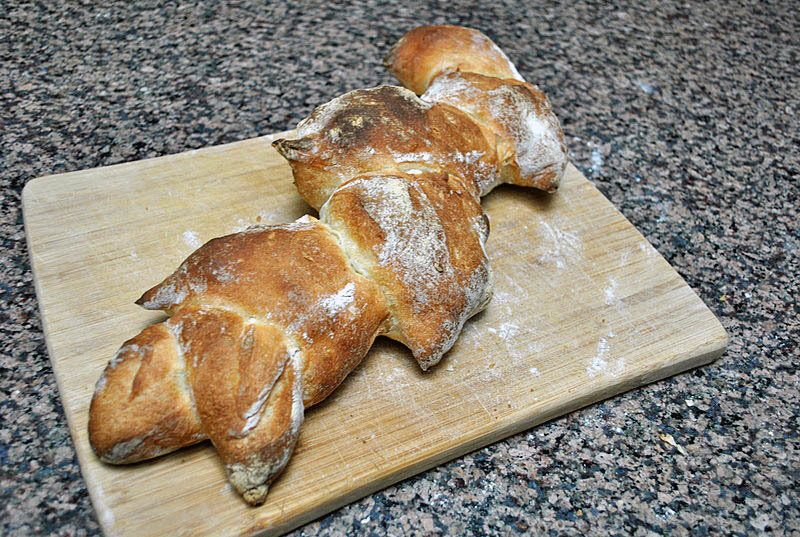 A baguette with such poor inner structure, with so much stuff added to the dough to prolong its sorry life, that it folds under its own weight. 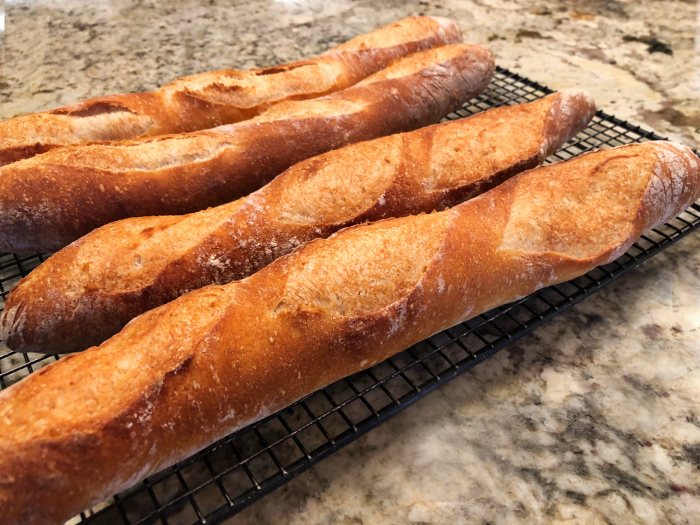 I have a few recipes for baguette in the blog already, but decided to bite the bullet and try America’s Test Kitchen version. I say bite the bullet because, as my friend Cindy always says, their recipes ensure that you will dirty every single pan, bowl, utensil you have. They don’t cut corners. They create them. In the case of their baguettes, the issue is not so much messing up stuff, but the timing and super detailed instructions. You can find the full recipe in their site, I will give just a very minimal overview, as I could not get permission to publish their method. Make a dough with all ingredients by kneading with a mixer for about 7 minutes. Leave it at room temperature and knead by folding three times, letting the dough rest for 30 minutes in between folding cycles. Refrigerate overnight. Remove dough from fridge, divide in half, work with half the dough at a time. Follow their precise measurements to obtain four portions of dough. They will instruct you to pre-shape the dough, minimizing how much you handle it, and with a lot of waiting time in between each manipulation, including the final shaping and stretching to a size compatible with home ovens. 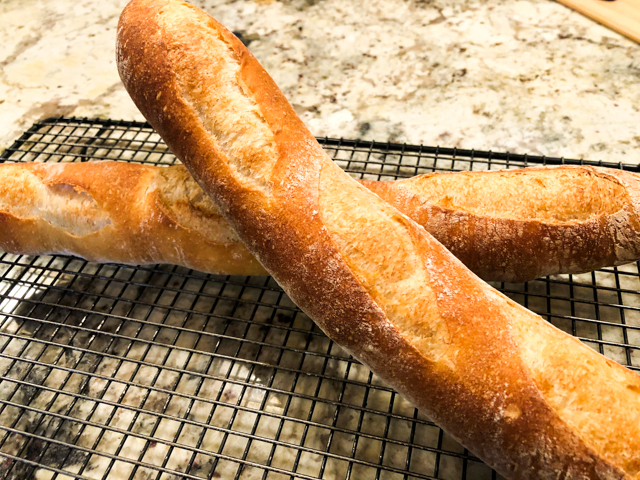 After a final rise of 45 to 60 minutes, the baguettes will be ready for a 500F oven, baked for 5 minutes covered with a disposable aluminum baking pan (excellent method to create steam), and uncovered for the final 15 minutes for proper browning. You will be able to bake two baguettes at a time. I did not bother retarding the two last baguettes in the fridge, as the baking takes a reasonably short time. Overall, it is a good recipe, just pretty convoluted in terms of all the instructions given for handling the dough. The inner crumb had the uneven holes that are the mark of a good baguette, but I expected a slightly more open structure. Taste was pretty spectacular, I think the proportion of whole wheat and all-purpose flour is perfect. I will probably do a few changes in the way I shaped it, because I suppose a bit more surface tension could be better, two of the baguettes were not as round as I would like. Second chapter on Cooking Projects 2012! Place all the ingredients in a large bowl, and using your hands or a plastic scraper, bring them together forming a very shaggy mass. The best way to do it is working the scraper down the sides of the bowl, and then rotating the bowl as you bring it up, and fold that part of the mixture on top. Do this movement about 20 times, which should mix everything together reasonably well at this stage. Do not worry about how smooth the dough is, it will feel and look very “rough”. Set a timer to go off every 30 minutes. You will fold the dough every thirty minutes, for a total of six times (at that point you will be 3 from the start). At each cycle, fold the dough on itself using a scraper, for a total of 20 times, either removing the dough to a surface, or folding it inside the bowl. 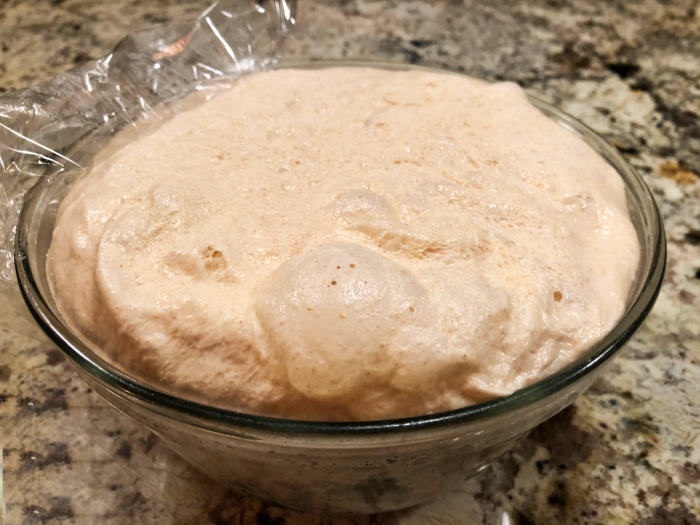 After the sixth folding cycle, leave the dough undisturbed for 30 minutes, then divide it in 12 ounce pieces (from the start, you will be at the 3 hour and 30 minutes mark). 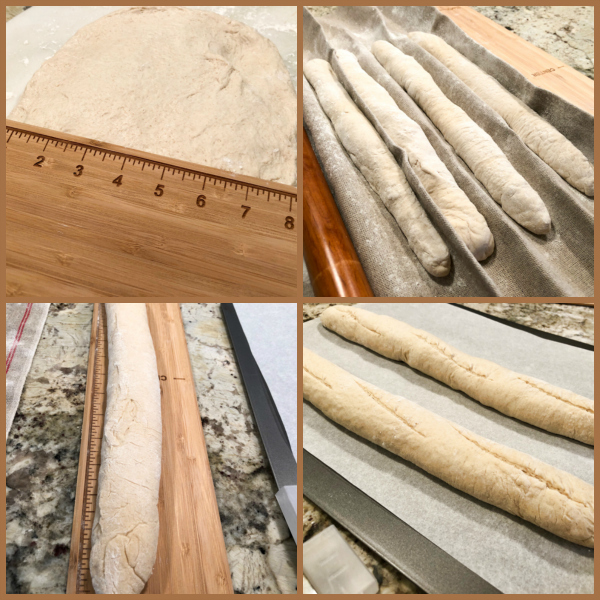 One full recipe makes 5 long baguettes. Gently form each piece into a cylinder shape, and let it rest for 15 minutes (very important to relax the gluten, don’t skip this step). Shape as a baguette, then roll the baguettes to stretch them to their final size (make sure they will fit over your baking stone or the surface you intend to bake them on). Let the baguettes rise (preferably using a couche well coated with flour) for 1 to 1 and a half hours at room temperature (ideally at 76 F). 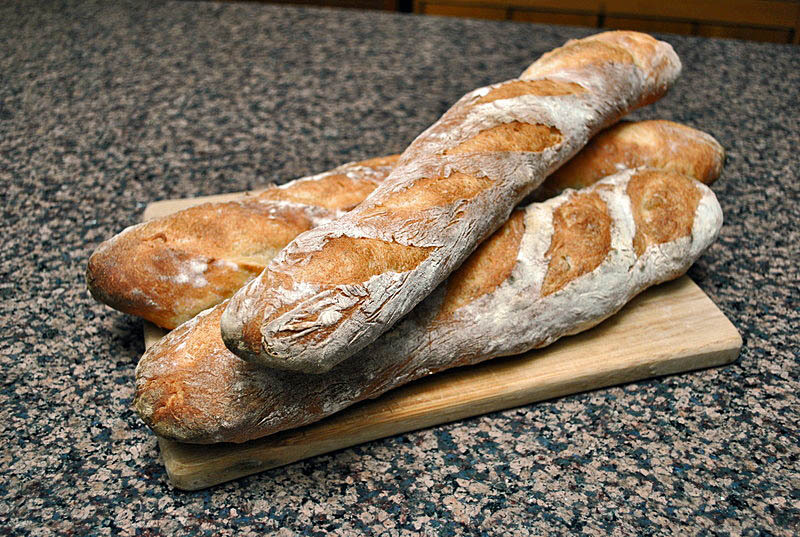 Score the baguettes and bake in a 460 F oven, with initial steam, for a total of 22 to 25 minutes. Cool completely before slicing. As to the shaping, I will be forever grateful to Gary, my friend and baker extraordinaire, who went through the trouble of mailing me a DVD of Chef Jeffrey Gabriel CMC, from Schoolcraft College. 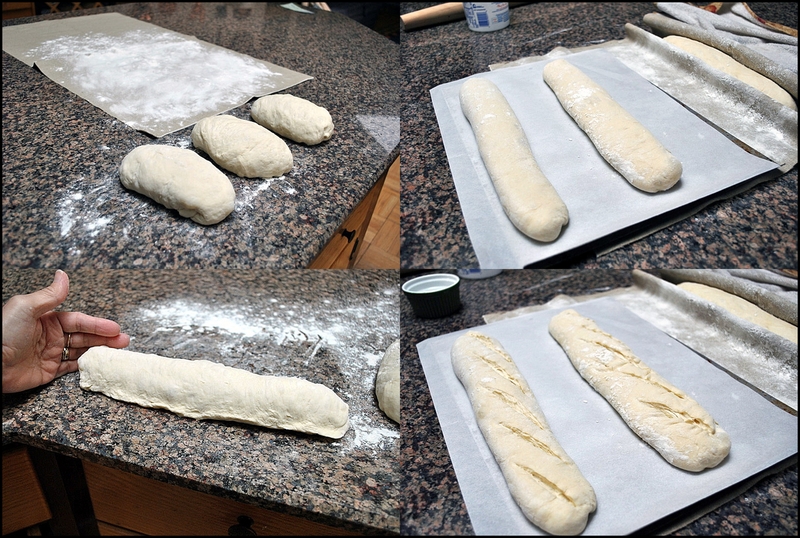 Gary made the video during his class on French baguettes, and I watched it over and over… and over! The main difference between Chef Gabriel’s technique and this one, is that he is not too concerned with where the seam of the baguette ends up. On my initial attempts, I was so worried about keeping the seam up for the final rise, that I ended up manipulating the baguettes too much and messed up their final shape. 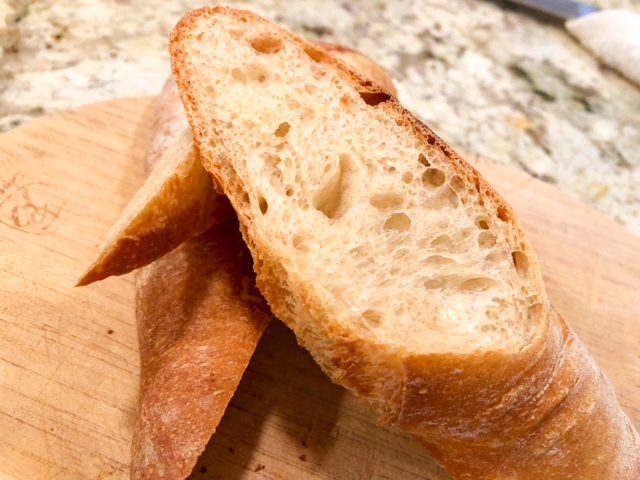 Gary’s method is much more user-friendly, and once you score the baguettes and bake them, the seam position seems to have no influence on the final look of the bread. 1. Coat the surface where the baguettes will rise (after the final shaping) with flour. They WILL stick if you forget this step, leading to intense grievance. 2. Allow the dough to rest for 15 minutes before shaping. You need that or the gluten will keep fighting back like an elastic band. 3. The better you get at shaping the baguettes, the longer they will be. If you want to bake them covered to create steam, this could be a problem. 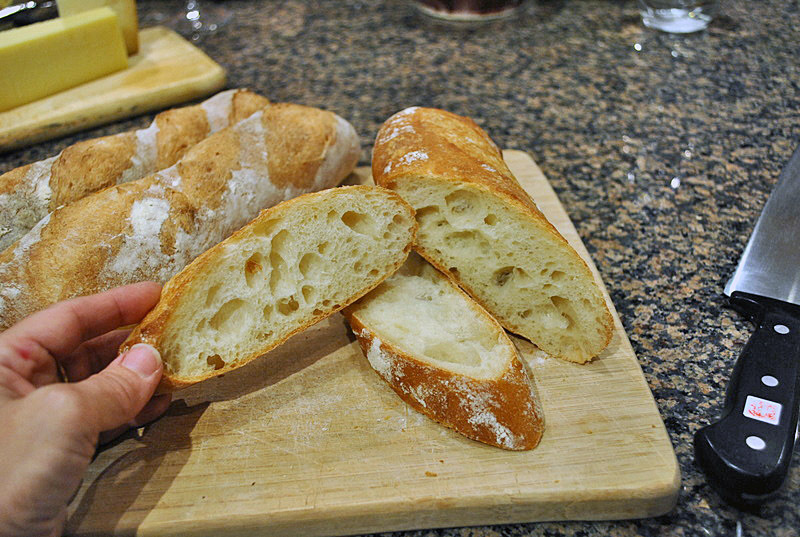 Consider making shorter baguettes – not authentic, but easier to bake in a home oven. 4. Baguettes are scored with an odd number of slashes. Usually 5 or 7. Some advise you to wet the blade to do it, I prefer to use a dry blade, as I like the “spiky” look of the slashes.